US military and British divers joined the search for a group of 12 children and their trainer of the soccer team trapped 5 days ago. US military and British divers participated Thursday in the search for 12 children and their soccer coach who have been in a flooded cave in northern Thailand for five days. The incessant monsoon rains in Chiang Rai province increase the level of water in the cave, forcing British divers to interrupt their advance, Thai authorities announced. US soldiers arrived in the area during the early hours to help local rescuers, according to Bangkok and the US embassy. “They are experts in diving and rescue at sea,” a Thai military source told AFP. The 12 children between the ages of 11 and 16 entered Saturday after their soccer training in the Tham Luang cave, located near the border with Burma and Laos. But the rain blocked the main entrance of that complex underground network several kilometres long. “I’m sad, I want my son to be safe and sound, but we do not have information from the authorities at the moment,” Thinnakorn, the father of one of the children, told AFP. “The divers are willing to return as soon as the water level has dropped to an acceptable level,” the Thai navy explained on Facebook. The first days of searching have not allowed to find any trace of the group inside. 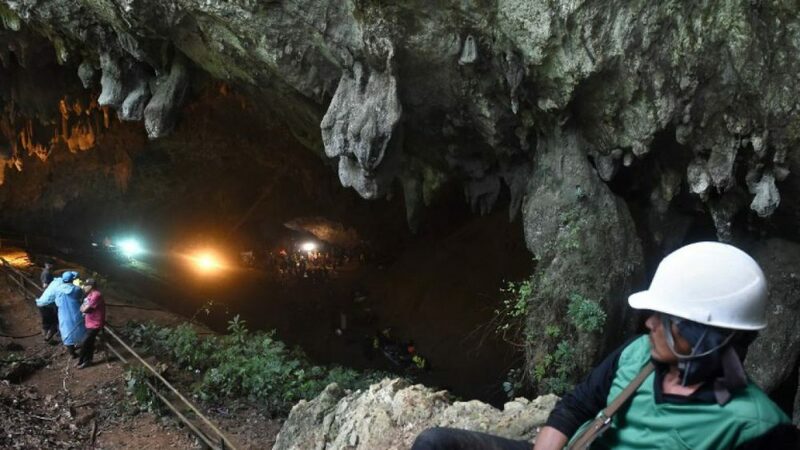 The authorities believe that they could have found refuge a little further in that cave to protect themselves from the flood. At the entrance of the cave, a sign warns visitors not to enter during the rainy season, between July and November.